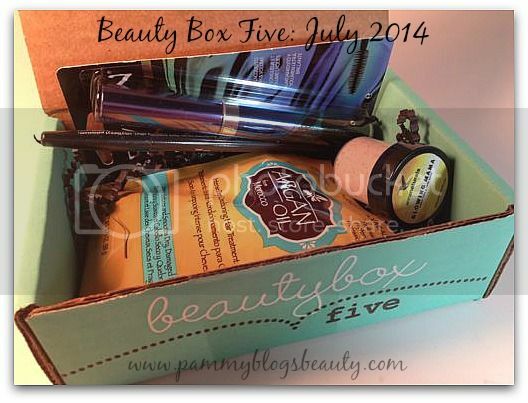 Pammy Blogs Beauty: Beauty Box Five: July "Defining Moments" Box Opening!!! Beauty Box Five: July "Defining Moments" Box Opening!!! Hey Beauty Box lovers, it is that time again...time for my monthly Beauty Box Five Box Opening Post! As a huge fan of beauty sample boxes, I always eagerly await their arrival. It is always interesting to see who has the "best box" each month. Not to mention, I love discovering the beauty gems inside. To find out more about what is inside this month's Beauty Box Five box, please click "read more" below! HASK Argan Oil | Intense Deep Conditioning Treatment (Full Size single use packet. Retails for $2.49): While this is a foil packet, it is still a full size treatment. You actually might get two uses out of this packet depending on how long your hair is (BB5 Suggests that you can get 2 uses). It will probably be single use for me since my hair is so long and thick. This treatment was designed for dry/damaged hair (me!!!). The results are supposed to last up to 2 weeks. I am seriously going to use this today! Update: I used this in the shower this morning. I applied after washing my hair and left it on about 5+ mins in the shower. I actually was able to use half of the packet for my hair. I absolutely loved the results! I found my hair to be very easy to style after with reduced frizz and increased shine and manageability. Love this hair mask! Body Drench | Candy Licious Lips (Full Size! Retails for $3.99): I don't know about ya'll...but, I can always use a lip balm. Always! I have never heard of this line. However, I am already loving this lip balm as I am applying it right now. ;) It has a delicious cotton candy scent. If you like super sweet smelling balms, you will love it. It is very moisturizing and feels great on the lips. The formula contains beeswax, coconut oil, and Vit E.
Star Looks | Lip Pencil in Bare (Full Size! Retails for $12.00): I have never heard of this line! This is a full coverage liner in a light brown shade. This looks quite wearable for everyday when I am doing a darker lip. Browns are not my usual shade for my lips. However, this color will be great for Fall. If I can't use it, I will pass it on to my Mom who loves brown toned lipcolor. 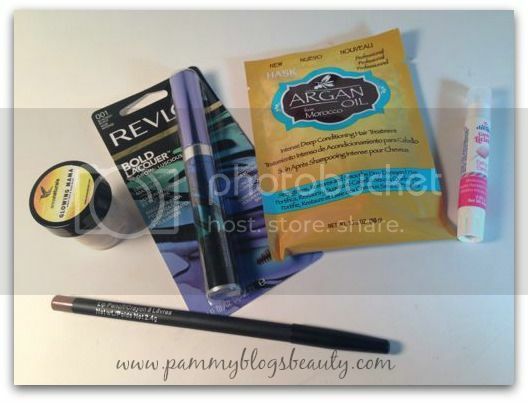 So, there you have it....the July Beauty Box Five box! Overall, a pretty good box. It has a nice variety sample-wise, is an incredible value considering the cost of the box, and introduces me to some new products and brands. What did you think of your Beauty Sample boxes this month? I think this month's box was my favorite yet! !